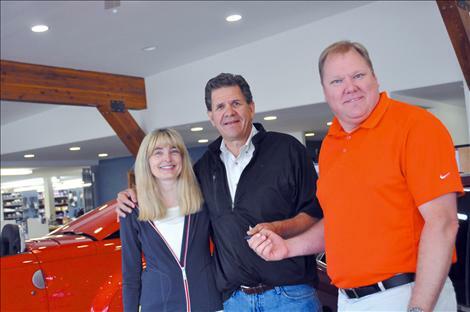 Debbie and Jim Pierce hand over the keys of their Ronan auto dealership, to nephew Tony Pierce. Pierce Dodge Ronan Chrysler Jeep Sales Manager Henry Kundig stands with Jim Pierce. RONAN — After spending eight years integrating themselves into the community and weathering the worst financial crisis in a century, Jim and Debbie Pierce handed the keys of their Ronan auto dealership to new owners last week. For the customers of Pierce Ronan Dodge Chrysler Jeep, the absence of Jim and Debbie will be the only subtle hint that the business has been sold. 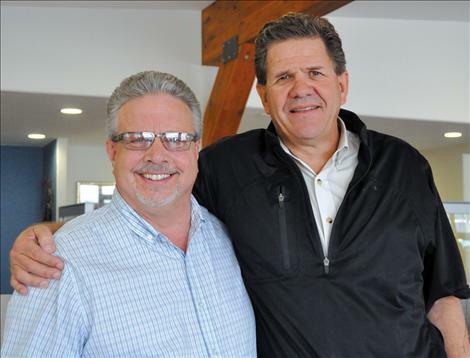 The family is leaving its dealership in familiar and trusted hands; Jim’s brother Dave Pierce will be at the helm with Dave’s son, Tony Pierce. “The name’s not going to change,” Jim said. 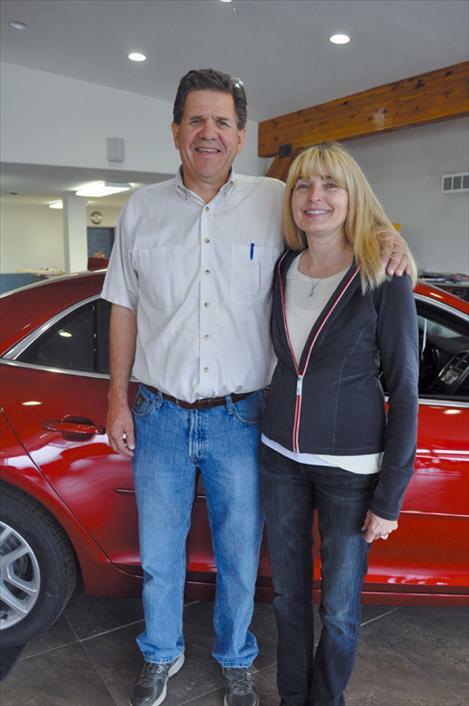 The store’s employees are also staying, as Jim and Debbie head to Sandpoint, Idaho where they own another dealership. The couple hopes to spend more time with their grandchildren after the move. Jim said leaving friends and loyal customers in the area will be the most difficult part of the relocation. 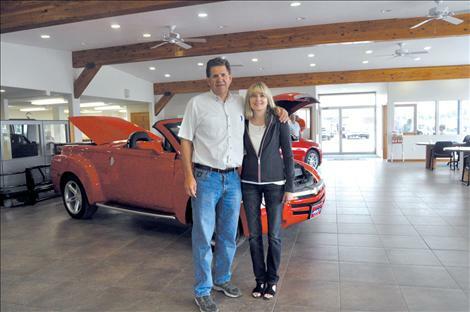 The couple bought the dealership in 2006 after previously owning auto businesses elsewhere in Montana. After the initial purchase Jim set out to make his first business investment in Ronan — two cows and a hog bought from local 4-H members at the Lake County Fair. The approximately $5,000 that went to the charitable cause laid the foundation for something that the Pierces wanted to be a cornerstone of their business — community-oriented giving. In eight years the business has given approximately $200,000 to community causes, with most of the funds spent in $50 or $100 increments to those in need. Jim said giving has been rewarding and is an important part of building community. Pierce said giving to children is especially important. He can remember the names of some of the 4-H members from whom he purchased livestock from in past years and is proud that they’ve gone on to Ivy League schools. The generosity doled out by the Pierces was made possible by strong support from customers in the community, Jim said. The road to success was a hard one. The family took over the dealership when business in the valley was booming. Condominiums in Polson were selling for $1 million, and though some long-standing customers for the Ronan dealership walked in and immediately backed out once they noticed new leadership at the helm, sales were doing fine. Then, just as the Pierces grew familiar with their customers and began to gain steam in their endeavors, disaster struck. “We were here for about a year and a half and the wheels came off the economy,” Jim said. The housing market crashed and the million-dollar real estate values tanked. The auto market quickly followed as major manufacturers faced bankruptcy. The Pierces faced the possibility of losing most of what they had if the major companies went under. Government bailouts prevented the automakers from going bankrupt, and provided a bit of salvation, but people still weren’t spending money. The Pierces didn’t want to let their employees go, so people were put to work painting and doing work around the shop. “We did whatever we could do to keep people working and on the payroll,” Jim said. Jim remembers a time in the crisis when the purchase of a single Dodge pick-up by the Confederated Salish and Kootenai Tribes meant the world. The truck was raffled off. “At the time it was a nice gesture, and it meant a lot,” Pierce said. After a year, things looked less grim. People began to spend money again, but the traditional methods of finding credit for buyers had changed. Jim said he wouldn’t still be in business if not for the help of First Interstate Bank. In the midst of the crisis, Jim took a chance and bought Mission Chevrolet and moved it from St. Ignatius from Ronan. The dealership was remodeled. “We actually ended up growing in the down time,” Jim said, although he notes that the economy hasn’t entirely recovered. The $1 million condos in Polson are worth $600,000 now. People separate with their dollars a bit more cautiously. But Jim’s grateful to have come out the other side of the storm. “I tell people that every time they see an empty storefront they should remember that it is just somebody’s dream that didn’t work out,” Jim said. Through hard work the Pierces have been able to expand their business. In 2013, the couple was approached about buying a Sandpoint, Idaho dealership. The pair bought the business, and sent son Nick Pierce to lead it in February 2014. Jim and Debbie decided to follow to be closer to their family. They’ve also diversified into other business ventures in Montana. The same business principles guide those endeavors. Jim’s brother Dave, who was Jim’s partner for more than 20 years, has a similar style of conducting business. As the business changed hands, Jim and Debbie thanked Mission Valley for their continued support.